Lately I’ve been noticing a big rise in gut health awareness and fermented foods. More and more people are starting to understand the importance that fermented foods play on our immune system and our overall well-being. I’ll admit that I wasn’t too fond of fermented foods in the past, mainly because of their strong aroma. But today, after understanding just how healthy they are and delicious they can be, I’m hooked on the stuff. So in the past, traditional Sauerkraut or fresh dairy products such as yogurt, which were indeed extremely healthy, were raw and unpasteurized. But now days we’re consuming store bought pasteurized products that are missing all their healthy guys, the probiotics. Our health begins in our guts, or as the ancient Greek physician Hippocrates once said, “All disease begins in the gut,” so it makes sense to feed it nourishing, unprocessed foods. If we feed it rubbish, the good bacteria in our guts will die and we’ll be vulnerable to illness and weakness. Plus, only we control what we put in our mouths. Too many “good guys” can lead to an imbalance in our gut. So start off with small portions a few times a week until your body adjusts, then gradually increase. And know that common side effects such as gas and bloating are to be expected. It’s simply our body ridding of the “bad guys,” and is perfectly normal. Go for raw unpasteurized fermented foods, which can easily be made in the comfort of your home. 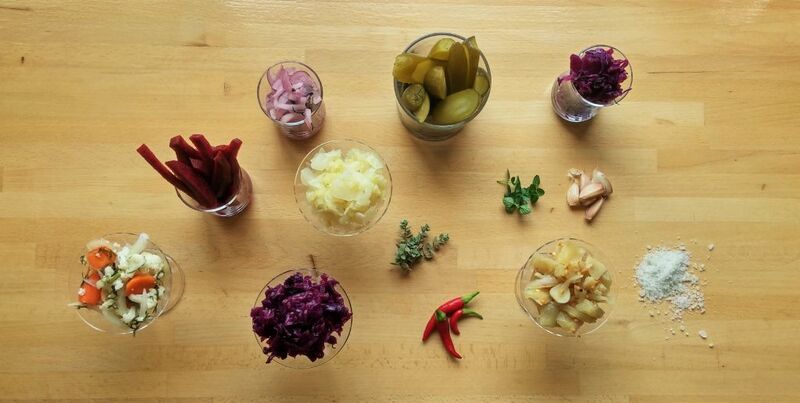 Try these delicious fermented vegetable recipes that I’ve just shared. Start off with small portions of fermented foods, until your body adjusts. And remember, a healthy gut, a healthy well-being.